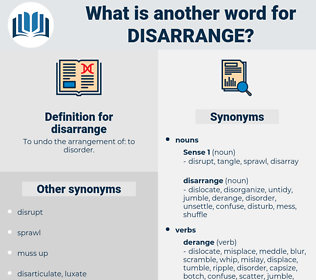 What is another word for disarrange? To undo the arrangement of: to disorder. are unable to lay hands on. compose, soothe, order, calm, comfort, organize. unscramble, straighten, fix, align, place, adjust, range, line, group, spruce, sort, regulate, systemize, queue, assort, array, groom, make up. Then Dorothy was in one of her impracticable moods, throwing cold water on all her young mistress's suggestions, and doing her best to disarrange the domestic machinery. The lace was ripped, as by a hand, from her dress, and the shawl was twisted about her throat; besides, her hair had not been so slightly arranged that the jolting of the carnage would completely disarrange it. diagramming, diachronic, dichromacy, dichromasy, disarming, dog wrench, decree nisi, discerning, dacrymyces, dicranaceae, disharmonize, disharmonious. ruffle, tussle, muss, ruffle up, rumple, tousle, mess up, dishevel, tangle.